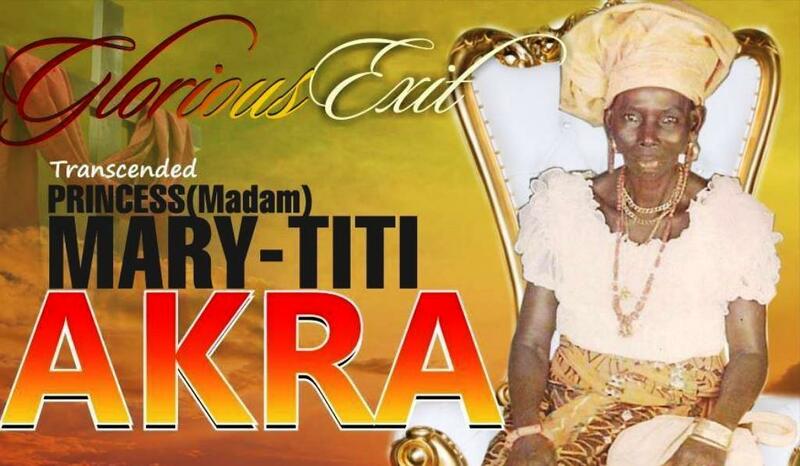 The burial arrangements for Late Princess (Madam) Mary-Titi Akra, mother of renowned televangelist and author, Patience Turtoe-Sanders, has been announced. The late mother of the founder of Celebrate Life International Ministry, a Christian group based in the United States of America, would be laid to rest this December. Late Madam Akra will lie in state with a service of songs on Thursday 27th December by 4 pm at her compound, behind old NEPA office, off Adeola road, Onakposigha lane in Sapele, Delta state. This would be followed by a funeral/interment service on Saturday 29th December beginning by 11 am at her residence in Ajagbodudu town, opposite Omateye College, Ajagbodudu, also in Delta state. Born January 1st 1926, Late Madam Akra is survived by Mrs. Nuway Esther Ogholaja, sister; Pastor Mrs. Elizabeth Okundaye, daughter; and Dr. Patience Turtoe-Sanders, daughter. She is also survived by Ms. Anita Menetie, daughter; Mr. Robinson Erebo, son; Mrs. Philomena Soetan, daughter; and Ms. Daisy Ayodele Umukoro, daughter. Also, Late Madam Akra, 92 years at death, is survived by 24 grandchildren and 33 great-grandchildren.